Electrospun Nanofibers covers advances in the electrospinning process including characterization, testing and modeling of electrospun nanofibers, and electrospinning for particular fiber types and applications. 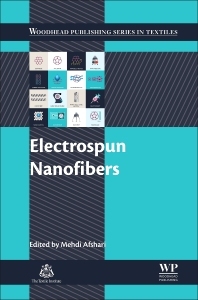 Electrospun Nanofibers offers systematic and comprehensive coverage for academic researchers, industry professionals, and postgraduate students working in the field of fiber science. Electrospinning is the most commercially successful process for the production of nanofibers and rising demand is driving research and development in this field. Rapid progress is being made both in terms of the electrospinning process and in the production of nanofibers with superior chemical and physical properties. Electrospinning is becoming more efficient and more specialized in order to produce particular fiber types such as bicomponent and composite fibers, patterned and 3D nanofibers, carbon nanofibers and nanotubes, and nanofibers derived from chitosan. Dr Mehdi Afshari lectured at the College of Textiles at North Carolina State University before pursuing a career in the textiles industry, firstly as a research scientist for Fiberweb and now for DuPont. His expertise lie in fiber and polymer processing, fiber spinning, electrospinning, nanofibers, fiber characterization, and improving fiber properties through the use of novel processing techniques. He is an industry expert with proven success in introducing innovative products to meet market needs.